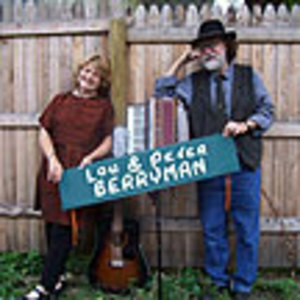 Lou and Peter Berryman have been collaborating in writing and performing songs together since at least the 1970's. They were married to each other very briefly, but divorced and married other people, keeping the last name for professional purposes. Their forte is writing funny songs and delivering them in a folksy manner to the accompaniment of Lou's accordion and Peter's guitar. Their most famous song is probably "Why Am I Painting the Living Room". A musical comedy based on their songs, "Love is the Wierdest of All" had a long run in Madison.